Europe is shaking under the engine noises from the 2017 Gumball 3000 race which started on July 1st in Riga, Latvia. The annual Gumball supercar race this year goes all the way to Mykonos, through Warsaw, Budapest, Porto Montenegro (where a lavish pit stop awaits), Dubrovnik, Tirana and Athens. Until July 8th, a total of 135 teams are competing in their supercars for fame and glory. The Gumball 3000 attracts a wide range of global citizens eager to compete beyond borders. 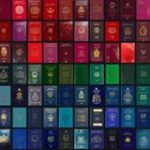 At Passport Index, we think about passports all the time! We took a closer look at the various teams listed on the website and we have applied Passport Index’ Global Mobility Score algorithm to compile the first ever Gumball 3000 Global Mobility Ranking 2017. The Global Mobility Score (GMS) for each team is calculated by adding the power of each of the drivers’ passports. The team with the highest cumulative Global Mobility Score is Team Beasts (#40) with a total of 169, meaning theoretically as a team they can “race” freely through 169 countries around the globe. The drivers are from Nigeria (M. Jarmakani) and United Kingdom (S. Baharun). The Global Citizen team, led by Arton Capital‘s Armand Arton and John Hanafin have a respectable score of 160 in their custom chrome gold BMW i8. The team with the lowest score is Team #44 (official name not listed). Both drivers are from Bahrain, which has a GMS of 77. Good luck to all racers! May the best team win! Two European Nations. One Caribbean Island.